مجموعه­ های دگرگونی گل­گهر، روتشون و خبر (در جنوب باختری بافت، استان کرمان)، جزیی از پهنه دگرگونی سنندج- سیرجان و شامل تناوبی از سنگ‌های رسوبی دگرگون شده، متابازیت‌ها و آهک‌های ناخالص دگرگون شده هستند. مطالعات مختلف نشان می­دهد که در این سنگ‎ها، اولین رخداد دگرگونی، با نخستین فاز دگرشکلی و جهت‌یابی کانی­های مسکوویت، بیوتیت، گارنت، کوارتز و فلدسپات همراه بوده و یک برگوارگی، موازی با لایه‎‎بندی اولیه (S0) ایجاد کرده است. رخداد دوم دگرگونی که با فاز دوم دگرشکلی همراه بوده، سبب ایجاد ریزچین‌ها و جهت‌یابی ترجیحی مسکوویت، بیوتیت، گارنت و آمفیبول و تشکیل برگوارگی S2 شده است. اما رخداد دگرگونی سوم، به‌صورت پسرونده بوده است که رخدادهای دگرشکلی و دگرگونی رخ داده منطبق بر فاز کوهزایی سیمرین پیشین هستند. ویژگی‌های ژئوشیمیایی سنگ‌های رسوبی دگرگون شده منطقه، بیانگر منشأ شیلی برای این سنگ‌هاست. تطابق و تغییرات سنگ‌شناسی واحدها در ستون‌های چینه‌شناسی، از شمال باختر به سوی جنوب خاور منطقه، نشان می‌دهد که در کمپلکس گل‌گهر (بخش باختری منطقه)، سنگ­های رسوبی تخریبی دگرگون شده، فراوانی قابل توجهی دارند. این بدان معنی است که سنگ‌های اولیه، در یک محیط کم ژرفا و آشفته تشکیل شده و همزمان با رسوب‌گذاری واحدهای تخریبی، ماگماهای بازیک نیز وارد حوضه رسوبی می‌شده­اند. با گذشت زمان، به سوی خاور و در زمان تشکیل سنگ‌های مادر کمپلکس روتشون، حوضه رسوبی کمی ژرف‌تر شده و گهگاه لایه‌های آهکی در میان سنگ‌های تخریبی و گدازه‌ها نهشته می‌شده است. سپس، حوضه رسوبی ژرف‌تر و آرام‌تر شده یعنی در زمان رسوب‌گذاری سنگ‌های مادر مجموعه خبر، مقدار زیادی آهک در حوضه ته‌نشین و فعالیت‌های ماگمایی به کلی متوقف شده است. روابط چینه‌شناسی مجموعه‌های یاد شده نشان می‌دهد که در زمان تشکیل سنگ‌های اولیه آنها نیز، ابتدا سنگ‌های مجموعه گل‌گوهر نهشته شده و در ژرفای بیشتری قرار گرفته­اند. به همین دلیل بالاترین درجه دگرگونی در بخش باختری منطقه (کمپلکس گل‌گهر و روتشون) و کمترین درجه دگرگونی در بخش خاوری منطقه (کمپلکس خبر) دیده می­شود. Gole-Gohar, Ruchun and Khabr metamorphic complexes (South-west of Baft, Kerman province), form a part of the Sanandaj-Sirjan metamorphic zone and contain an alternation of metamorphosed impure limestone, sedimentary rocks and basic igneous rocks. Different studies show that the first metamorphic event has been associated with the first deformational phase and orientation of muscovite, garnet, quartz and feldspar in these rocks. At this stage, a foliation parallel to the primary bedding (S0) formed. The second metamorphic event which has accompanied with the second deformational phase, caused the formation of microfolds and preferred orientation of muscovite, biotite, garnet and amphibole in the second foliation (S2), but the third event has been acted as retrograde metamorphism that are corresponding to early Cimmerian orogenic phase. Geochemical characteristics of metamorphosed sedimentary rocks in the area suggest a shale origin for them. Correlations between units and lithological variations in stratigraphic columns from north-west to the south-east, indicate that in Gole-Gohar complex (western part of the area), metamorphosed detrital sedimentary rocks are frequent. This means that the primary sediments have been settled in a turbulent shallow environment and the basic magmas have been entered into the basin simultaneously. With the passing of time, toward the east and at the time of the formation of Ruchun complex protolith rocks, sedimentary basin has been deepened more and occasionally, limestone layers were formed between detritic sediments and igneous rocks. Then the basin became very deep and large volume of limestone precipitated during formation of Khabr protolith rocks. At this time, igneous activity had been ceased. Stratigraphic relationships in the studied complex suggest that Gole Gohar complex rocks formed first and placed at deeper levels at the time of the formation of their parental rocks. Therefore, the highest grade of metamorphism occurred at the western part of the area (Gole Gohar complex) and the lowest grade is observed at the eastern part (Khabr complex). سبزه‎ئی، م.، 1376- نقشه زمین شناسی خبر، مقیاس 100000 /1، سازمان زمین‌شناسی و اکتشافات معدنی کشور. 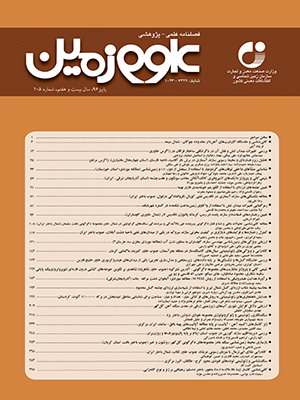 شفیعی بافتی، ش.، 1379- تکوین ساختاری و تکتونیکی سنگ های پالئوزوییک- مزوزوییک کمربند سنندج- سرجان، منطقه خبر (جنوب غربی بافت)، پایان‎نامه کارشناسی ارشد، دانشگاه شهید بهشتی، 153 ص.
Arkai, P., Mata, M. P., Giorgetti, G., Peacor, D. R. and Toth, M., 2000- Comparison of diagenetic and low-grade etamorphic evolution of chlorite in associated metapelites and metabasites: an integrated TEM and XRD study. Journal of Metamorphic Geology 18: 531–550. Best, M. G., 1982- Igneous and metamorphic petrology. W. H. Freeman and Co., San Francisco 2: 1-630. Bheemalingeswara, K. and Tadesse, N., 2009- Petrographic and Geochemical Study of Low Grade Metamorphic Rocks around Negash with Reference to Base Metal Mineralization and Groundwater Quality, Tigray, Northern Ethiopia. K. Bheemalingeswara and Nata T (MEJS),Mekelle University, Mekelle 1: 106-132. Castro, A., Fernandez, C., De La Rosa, J. D., Memeno-Ventas, I. and Rogers, G., 1996- Significance of MORB derived amphibolites from the Aracena Metamorphic belt, southwest Spain. Journal of Petrology 37: 235-260. De La Roche, H., 1996- Sur existence de plusieurs facies geochemiques dans Les schistes Palezoiques des Pyrenees Luchonnaises. Geology of Rundsch 35: 274-300. Engel, A. E. J. and Engel, C. G., 1951- Origin and evolution of hornblende andesine amphibolites and Kindred facies, Bulletin of Geological Society of America 62: 12-35. Evans, B.W. and Leake, B. E., 1956- The composition and origin of the striped amphibolites of Connemara, Ireland, Journal of Petrology 1: 337-363. Garrels, R.M. and Mackenzie, F.T., 1972- Evolution of sedimentary rocks. W.W. Norton and Co., Inc.,New York 397 pp. Herron, M. M., 1988- Geochemical classification of terrigeneous sands and shales from core or log data. Journal of Sedimentary Petrology 58: 820-829. Kamp, P. C., Leake, B. E. and Senion, A. , 1976- The petrography and geochemistry of some Colifornia arkoses with application to identifying gneisses of metasedimentary origin. Journal of Geology 84: 195-212. Leake, B. E., 1964- The chemical distinction between Ortho- and para-amphibolites, Journal of. Petrology 5: 238-254. Mason, B. and Moore, C. B., 1982- Principles of geochemistry. John Wiley and Sons, 344 pp Pettijohn, F. J., Potter, P. E. and Siever, R., 1972- Sand and Sandstone. Springer-Verlag Berlin, Heidelberg, New York 1.5.13: 1-618. Shaw, H. R., 1972- Viscosities of magmatic silicate liquids: An empirical method of prediction. American Journal of Science 272: 870-893. Suk, M., 1983- Petrology of Metamorphic Rocks. Elsevier Scientific Publishing Company 322p.